When you first start learning to juice it may feel like you will never have time to do anything else in your life. You have to make the juice fresh daily or at least every other day and depending on the type of juicer you have, it could take some time to prep all of your fruits and vegetables to get the job done. Perhaps the issue of time is what has held you back from starting a juicing regime or maybe you used to love juicing buy lifestyle changes make it more difficult these days. This is completely understandable, but you don’t have to let juicing take over your world. You can incorporate it into your life without give up all of your free time. First, get your thinking about juicing straight. Many people do think of juicing as lifestyle and they are willing to work their schedule around their juicing activities, but you don’t have to do that. If your life is more complicated and time is short, think of juicing as a healthy part of your life. This is something you are adding into your schedule, rather than something that will dictate your schedule. Take the time to think about the main benefits you want to get from juicing. If you are trying to lose weight you probably want to use homemade juice to deliver nutrient-packed drinks that will give you the energy to get through tough workouts. If you are trying to live a healthy diet to preserve your health and youthfulness, then you probably want to use your fresh juice to deliver antioxidants and powerful phyto-nutrients to your body in large concentrations. Once you know your main goal with juicing, think of simple ways to incorporate juicing either on a daily or weekly basis. If you are trying to lose weight and need your juices for energy, then whipping up fresh juice a few hours before a workout could be all you need. If you are trying to increase the antioxidants and nutrients you take in daily, then starting your day out with a fresh smoothie made with homemade juice could be the perfect routine. Juicing can be a lot of fun if you have the time to stock the kitchen with every fruit and vegetable under the sun, prep them all, and play around with unique combinations and recipes found online. Yet, if you don’t have time for all that you don’t have to do all that to get the benefits you really want. It is enough for many people to just find a few good Juice Recipes that they enjoy and which meet their most basic needs and goals. That cuts down on the amount of fresh produce you have to keep stocked (which cuts expenses) as well as the amount of time you have to invest in the juicing process. One last tip that will really cut down on the amount of time you spend juicing: invest in a really good Vegetable Juicer that works fast. One that is good is the Breville Juice Fountain Elite. Many of the cheaper juicers take awhile to process and that is what makes the process a bit more costly in terms of time. Invest a bit more of your money for a very fast and highly efficient machine and you will have to invest a lot less time in the process. Hello good lookin’ are you ready to start cookin’? I’m the Twin Gear Juicer and I am the cream of the crop. Juicing fanatics who will settle for only the best pay top dollar for me because they know I will outperform all the rest. I have two gears that turn around one another to twist, press, and rip apart fresh produce in a more efficient manner than all other juicer types. I am worth more than other juicers because I break apart even the tiniest veins to release more nutrients for your body. I work twice as hard so you can benefit twice as much! My delicious juice is far more nutrient-packed than the juices you get from other juicers, but I also make more juice. I give you dryer pulp and about 25% more juice so your money stretches further with me on your counter. I can sometimes be made from bio-ceramics like the Green Star Juicers, and that makes me even better because it helps me pull out even more nutrients. Unlike the other types of juicers, I love chewing through green leafy vegetables, including wheatgrass! I can actually turn them into chlorophyll drinks if you want…that’s how good I am! I’m not going to be a good fit if you are on a tight budget unless you really shop for a great deal, but I promise I am worth every dollar on my price tag. I am the best juicer if you are serious about making juicing your way of life or if you just want really delicious, nutritious juice and will only settle for the best of the best. I’m the Wheat Grass Juicer and obviously I’m just good for taking fresh wheat grass and turning it into healthy chlorophyll juice to nourish, heal and energize your body. I am very popular today because more people realize that chlorophyll can do wonders for the body and natural wheat grass juice is more beneficial than supplements. This was all started by Charles F. Schnabel back in the 1940s, but millions of people are benefiting from the knowledge today. If you want to juice up a variety of veggies and fruits in addition to wheat grass you should look at the powerful masticating juicers or those elitist twin gear juicers, but if you just want a simple manual wheatgrass juicer to use on a casual basis, I’m your girl. I’m also very affordable, especially if I’m manual. Half up those oranges, grapefruit, and tangerines because I’m ready to start squeezing them! I am the simple yet deliciously sweet citrus juicer and I can take any type of citrus fruit from large oranges to small limes and turn them into fresh juice in just minutes. You cut your fruits in half and press me down over them and I squeeze out juice rich in vitamin C. If you use oranges, I can also give you tons of potassium, thiamine and folate. Sure, you could use those other juicer types to get juice from citrus juices, but there are two reasons to save your citrus just for me: I use much less oxygen and heat so your juices will last longer in the fridge and my juices are much higher quality than what you can achieve with any other type of juicer. Which juicer personality makes you smile the most? Which one reminds you of yourself? Which one might be the best fit for your expectations, standards and budget? Anyway you go you will have the ability to improve your health and general well being by drinking pure juices with no additives, colorings or preservatives and all their natural nutrients left intact. Now that you have an idea what type of juicers are on the market and what their differences are, it’s time to start learning how these juicers can bring you greater health. It’s time to stock up on knowledge so you can hit the store and stock up on healthful, delicious fruits and vegetables! Missed part 1, you can find it here What’s Your Juicing Personality? 1. Not all fruits are the same. Fruits will give your juice the tangy, sweet flavors that most vegetables lack. There are a couple of things you should be aware of in regards to citrus fruits and melon. Not all juicers will work well with citrus fruits, so you may want to purchase a separate citrus juicer for those. They are usually inexpensive and easy to use. But you can certainly peel them and cut them into pieces for you juicer, this works fine for wonderful juice combinations, but if you want just citrus go for that type of juicer. Also, melon tends not to mix well with other fruit juices. Most other fruits can easily be juiced together in any combination you like! Fruits are naturally high in sugar and can spike your blood sugar and create an imbalance, so be careful if you are sensitive to sugars. You may want to dilute them with water a bit. 2. Apple is the great sweetener for vegetable juices. Not all fruits will work well with a heavy vegetable juice. If you are juicing with a nice blend of veggies you can use apple to sweeten and can save your other fruits for a nice fruity blend. You don’t have to stuff five different vegetables and a few fruits into a single juice blend to get maximum benefits from juicing. Just pick 2-3 vegetables and perhaps toss in some apple for sweetness and you will have delicious and nutritious juice. It’s the same with fruits. Picking just a couple to combine together will allow you to taste each fruit and enjoy the concoction more. 4. Drinking your juice prior to a meal is best. Fresh homemade juices are great choices for snacks when you don’t have a lot of food in your stomach and are excellent just an hour or two prior to eating a large meal. Your body will absorb more of the nutrients and enzymes since the juice is sitting on an empty stomach and you will feel more full when you sit down to eat, which will help you control your portions so you eat less. 5. There are more fruits and vegetables out there than you know of. Make it a point every time you go to the grocery store to explore new options in the fresh produce department. 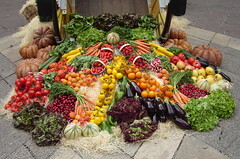 Scour local farmers markets and stop at those roadside stands where farmers direct sell their goods. You may find some delicious, nutritious fruits and vegetables that you don’t already know about! 6. Don’t juice up the same thing every day. Your body needs a wide variety of nutrients, so make it a point to juice different fruits and vegetables on a daily or weekly basis. You can purchase in bulk for a week to save money, but make sure to change an ingredient or two every week. This will also keep you from getting bored with your juices. 7. Some fruits and vegetables do not turn into juice. The consistency of different fruits and vegetables varies and some will turn into a puree rather than a juice. For instance, adding banana into a fruit smoothie gives it a thicker, creamier consistency. Fruits and vegetables with this consistency should be blended rather than juiced. You can always make fresh juice and then pour some into a blender with these fruits and vegetables for a nice smoothie. 8. Leafy greens will work best if you squish them together prior to juicing. Rather than just tossing a handful of spinach leaves into your juicer machine, ball them up together so they are more like a well formed piece of fruit. The juicer will work best with them this way. 9. Coffee filters eliminate pulp. If you don’t want pulp in your juice you can use a coffee filter to keep the juice clear. 10. Lemon juice eliminates color changes in fresh juice. Toss in a teaspoon or two of fresh lemon juice and your juice will not change colors while in the fridge! Juicing for maximum health benefits doesn’t have to be a radical change in your life. It can be a delicious addition to your current diet that you enjoy and look forward to! Everyone loves a quiz, especially when the results give a brief glimpse into your soul. This isn’t exactly a quiz, but it is a fun way to break down the different types of juicing machines on the market today and determine what type fits best with your life. Here are the juicer types on the market today and a brief introduction to their personalities. All three of these things are important when picking out a home juicer because you won’t be happy if the machine doesn’t meet all of your expectations and deliver juice that fits your standards for health and nutrition. Of course, you are always bound by your budget! Hello! I am the most basic juicer on the market. I am perfect for juicing newbies because I am usually the most affordable type of juicer on the market. I can work with most fruits and vegetables, but not all, and can often juice up larger pieces of fruits and vegetables than many other types of juicers can handle. That means I am a bit faster and won’t make you do a lot of chopping. I have to admit it means I often have a big mouth, especially if you go with a whole fruit juicer. My speeds typically range from 3600 RPM to 13,000 RPM, so you can see I am quite fast. I am usually very easy to use and cleaning me is a breeze since many of my parts love splashing through the dishwasher. No one likes to speak poorly of themselves, but since I have a big mouth I’ll give you a tip: I ‘m not the best choice for working with leafy green vegetables, but I sure taste yummy! I may be your dream come true if you are on a tight budget or want something very simple to use. Sadly, I won’t meet your expectations if you like juicing wheatgrass and other leafy greens or if you want the richest juice possible, I give it my all. Step back and watch me in action! I’m the masticating juicer and I am long, lean and packed with muscle. My genuine personality shines through when you pick up a Champion juicer, but there are also some versions of me that use other processes that work a bit differently. They still get to use my “”masticating” title, but the Champions resemble my genuine charm. As a single gear juicer I crush open fruits and veggies, smashing the crushed veins against a screen to squeeze out the wholesome goodness your body craves. In Champion form I use a three phase process to flex my muscle and pulverize almost any fruit or vegetable you throw my way. Despite my muscle and forceful charm, I am also be quite tall and slender like the Omega Vert 350 juicer. I don’t take up a lot of kitchen space and am easily stored away when you don’t need me. Unlike the centrifugal juicer I operate at a slower pace, allowing my muscle to do the work rather than relying upon speed. Due to this slow nature my juice is less foamy and contains a higher concentration of vitamins and minerals because oxidation doesn’t occur when you take it slow. One other difference between me and the centrifugal juicer is my juicers won’t be completely smooth unless you run it through a sieve. I may leave small bits of pulp with some fruits, but it’s nothing a quick filter won’t fix and frankly if you’re serious about the sport this is what it takes! Oh yeah, and there is a dual stage masticating juicer…it’s a different side of my personality! I push my muscle further to squeeze out even more juice after smashing the pulp against a screen. The Omega Juicer 8003 juicer or the Tribest SoloStar-II Juicer SS9002 are great examples of my flexing power in action. If you want a reasonably priced juicer that contains a higher concentration of vitamins and minerals than the centrifugal juicer can produce, I’m your man! You can consider me the middle of the market, though with these smoking guns I consider myself worthy of any kitchen counter. Juicing the Pulp, Peels, and Seeds – Never Throw Them Away! The joy of juicing is not just about nourishing and cleansing your body. While the health benefits may be what initially lead you toward a lifestyle of juicing, the concepts of getting the most from your food, helping the environment, and never wasting a dollar are also very important to many people who live this lifestyle. Purchasing a juicer that squeezes every last dollar of nutrient-rich juice out of every piece of produce juiced is important to getting the most out of your food, but knowing what to throw away and what to keep can help you stretch your food even further. * How to use the pulp for more than just a trash can contribution. * Understanding which fruits and vegetables should be peeled prior to juicing. * Knowing which fruits and vegetables have potentially dangerous seed and which seeds are highly nutritious. A good juicer machine will produce very dry pulp because it will squeeze the maximum amount of goodness out of the fruit or vegetables so more of it makes it into the juice. While this dry pulp is the sign of a high powered, highly functional juicing machine, that dry pulp is not worthless. It still contains a lot of the fiber our body needs as well as some enzymes, vitamins, minerals and other nutrients. The pulp that remains after a round of juicing can be used in the batter of many baked goods. Think of adding fruit pulp into the batter for a fruit flavored cake or perhaps muffins, for instance. This will give them a bit of flavor, especially if you are baking whole grain or bran muffins that could use some lightening up and extra flavor. You may also consider using the pulp from your juicer in compost for the garden or perhaps as food for animals that love fruit and vegetables. Try making homemade dog biscuits. You may find yourself creating different combinations of fruit and vegetable juice with these other purposes in mind. For instance, when creating a fruit juice for the morning meal you may choose flavors that will taste delicious in muffins to be baked for snack time later on. You can even use your pulp to create homemade sauces from a variety of different fruits. These sauces can be drizzled over baked goods or perhaps placed inside crepes and other delicious treats. Not only will you be getting the most out of every drop of food and saving money and time, but you will be adding more nutrients and added fiber into the food that nourishes your body and that of your family. Understanding which foods need to be peeled and which ones are best juiced with the peel on is a big issue for those just starting out in a juicing lifestyle. For starters, try to get a hold of organic fruits and vegetables that have not been sprayed with pesticides or treated with unnatural fertilizers during the growth and harvesting process. When you are using produce that is not organic you should consider peeling everything to get rid of trace of these chemicals. Of course, you can also use non-organic fruits and vegetables and really scrub the peels down hard prior to use. This will at least minimize the unnatural chemicals that are consumed through the juice. In some cases it may be enough to eliminate the toxic elements of fertilizers and pesticides. You want to keep the peel on your fruits and vegetables as often as possible because that is where the majority of the nutrients, vitamins and minerals are located. When you strip the peel you are giving up many of the heath benefits that would otherwise be enjoyed. If you don’t like the taste of particular peels then you may want to strip about half of it off, leaving the rest since it will be masked with the blend of other fruits and vegetables combined in your juicer. The final consideration regards the seed that naturally grows in the center of many fruits and vegetables. When dealing with soft, tiny seeds such as those incorporated in tomato you will of course just juice them up with your vegetable and fruit. They will just add some extra nutrition to the final product. Yet, there are some seeds which many people believe are unsafe for consumption. That would include apple seeds, which contain natural cyanide. There is hot debate over apple seeds with some people claiming they are perfectly safe to juice while others claim they are unsafe. And of course you have peach seeds, obviously you don’t want to eat these and mess up your blender or juicer. Another fruit of concern is the pomegranate, due to the huge number of seeds inside each piece of fruit. Most people will juice these seeds and eat the seeds while enjoying the fruit fresh. They are a bit tough to chew up but contain the majority of the antioxidants that make the fruit so beneficial to your health. Remember, juicing is about more than just nourishing your body and cleansing your system of potential toxins. When you make use of every string of pulp, every slice of peel and every little seed you can save money and infuse all of your meals with nutrients you would otherwise toss in the trash can!